I suppose there exists, somewhere on this planet, an ornamental gardener who has never grown a plant that they had been given from someone else’s garden, but it is hard for me to imagine it. Before I even knew myself to be a gardener, when I was just a kid, I tagged along behind the lady next door as she planted annuals, despite the fact that our game balls were always flying into her garden, and she was always yelling at us, and I thought she hated all us kids. I don’t remember the conversation between us that day, but I probably pestered her with questions without realizing it, because she gave me half a dozen dwarf marigolds from her flat to plant in my own yard. I wasn’t even out of grade school yet, and I had my first passalong plant, sort of. 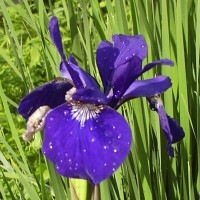 Like Bender and Rushing, authors of Passalong Plants , I consider passalong plants to more typically be a piece of a plant, be it seed, cutting, sucker, division, or bulb, passed from one gardener to another. But I like to think that Mrs. Rosano recognized that incipient spark of interest in me and decided to encourage it, despite the #%&* kickball that kept landing on her prize basket-of-gold, or whatever was looking spectacular at the moment. The house where we live now is over a hundred years old, and I would guess the garden is just about as old. 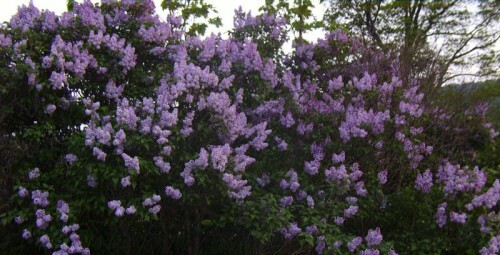 The next old house down the road shares the same lilacs and the same–believe it or not–colchicums. So on the day I moved in, I already had some passalong plants shared between two gardeners who came before me. As you might imagine, I discovered others as the first growing season progressed. There were several kinds of daffodils, almost all growing blind (no flowers) because of overcrowding. 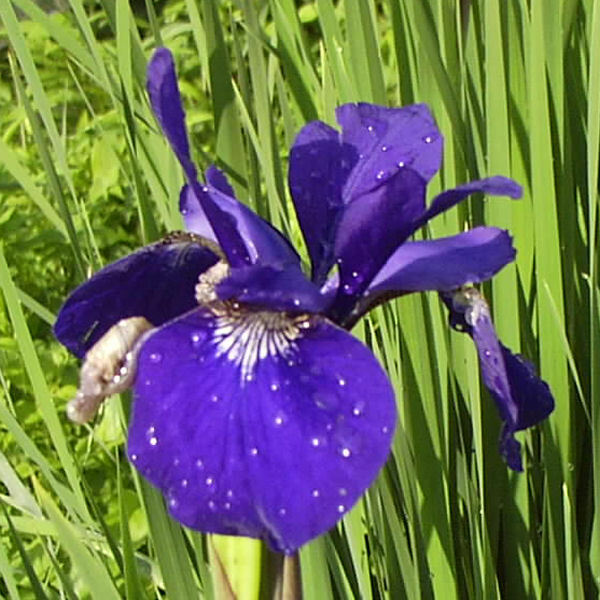 There were bearded irises and Siberian irises and at least two kinds of peonies, one of which was growing in a tire. I didn’t recognize the foliage of lupines and Oriental poppies, and almost dug them up as weeds. There was a rose that I now know to be native, and a few others that still had their Jackson & Perkins metal tags. 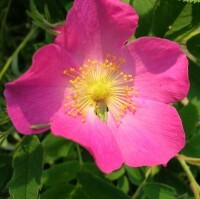 Rose of Sharon, snowberry, mockorange, and tartarian honeysuckle were other shrubs growing without help. There was a wonderfully fragrant tall white phlox, admirably mildew resistant and blooming into September. And when I cleared ground, other plants, such as morning glory and ‘Zebrina’ mallow, grew from seed sown years ago. As I researched my newfound treasures, I realized most of them would qualify as heirloom plants. Funny how you get a concept in your head. If you had asked me before we moved here what I thought about heirloom plants, I would have guessed they were inferior plants of little interest except to gardeners who were concerned with historical accuracy in their plantings. But I would have been wrong. These plants had persisted for years, through tender loving care and unavoidable neglect, through good weather and bad. They were survivors, the kind of plants you build a garden around, because they won’t let you down, unlike the latest introduction of untested mettle. I started out thinking of heirloom plants as belonging to places like Williamsburg and Monticello, and they do. But those places have very structured, manicured gardens that need lots of labor to keep them up. What were they doing in a garden like mine, where nothing was level, plumb, or square? I was looking for a word to describe my kind of gardening, and I found it: cottage gardening. The original cottage gardeners were employed by the landed class in England, and given cottages with a bit of land around them as part of their employment. Growing food was the cottagers’ top priority, growing medicinal plants probably a close second, but the pretty plants were shared amongst neighbors, and tucked in here and there. So cottage garden plants were always passalong plants in the beginning, treasured by gardeners living from hand to mouth, eking a little time to care for them from a long day spent laboring for someone else. Hardship can seem so romantic when experienced secondhand. It is easy to think of cottage gardening as a style, rather than a way of life. America’s Cottage Gardens by Patricia Thorpe profiles gardeners in the United States who are carrying on the cottage gardening tradition more authentically than what is seen in magazines that proclaim it as a lifestyle. A lot of the people in her book could have stepped out of Passalong Plants. Bender and Rushing don’t make a big deal out of it, but you get the impression that many of the gardeners in their book have seen hard times, and their passalong plants may have been the only nice thing in their lives at times. Passalong plants are the comfort food of gardening. They are easy and remind you of the love you have received in the past, which is good to think of when you need comforting. These three concepts overlap to the point that it is hard for me to differentiate between them, but let’s give it a try. Passalong plants refers to the method by which you acquire them. Heirloom plants refers to their age, their history, their ability to endure. Cottage gardeners need free plants that will endure without babying, and so they wind up gardening with plants that other gardeners have extra of, which, quite often, are heirlooms. If I weren’t pretty confident that, on occasion, cottage gardeners indulge in something new, maybe even “store-bought,” I’d say that all cottage gardening plants were passalong heirlooms. 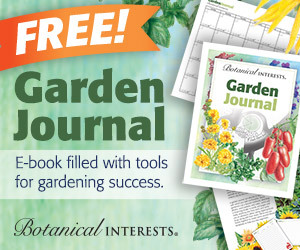 These musings were inspired by the April-May meeting of the Garden Bloggers’ Book Club. And, yes, I know it’s June. What a wonderful, thought-provoking post, Kathy, making all of us consider whether the plants we grow might be called Heirloom, Passalong, or Cottage garden flowers… and which ones can be all three. The bulbs here were some Ice Follies daffodils – you and MSS had more of a treasure hunt when you moved in! Kim–maybe the “practical” factor was at work: those old-timers needed everything to be practical in order to survive, so of course they needed good vegetables in order to thrive, but by the same token, their flowers couldn’t have been much. MSS–I tend to favor fragrance myself. I was shocked–shocked, I tell you–to learn that many lilies don’t have scent. My very first lily was an Asiatic, but it was only after it was blooming in my garden that I learned Asiatics are scentless. I had already learned this about peonies and roses, so why it should shock me about lilies, I don’t know. Probably because I had spent money on the lily, and thus felt gypped. Our paths through the garden have run a parallel course for all that we’re separated by climate. I inherited all sorts of heirloom bulbs when I moved into this house. That sparked my interest in other types of heirlooms (tomatoes, roses, old-fashioned flowers from Select Seeds) and also in cottage gardening. One reason I like old-fashioned flowers is that I value scent over lavish form. Kathy, what a great post. I have had some of those same thoughts re: the worthiness heirloom plants… I am just now coming around to some of these, like the ‘Black Watchman’ hollyhocks that were once grown at Monticello and are about to bloom in my backyard. Curiously, I was sold right away on heirloom vegetables but not heirloom ornamentals. I wonder why? What a wonderful thing to find a garden with so many flowers already there. On our new lot no such luck, but I do have quite a formidable collection of passalong plants from friends all over. Crotons and bougainvilleas were an easy one-I toted cuttings by the dozen in my hand luggage! Sharing plants is quite a tradition in most Caribbean islands ( and I guess among gardeners worldwide). Though I have encountered people hostile to the idea of sharing cuttings/offsets.n no time. Kelly–Thorpe’s book is the only one attempting to document authentic cottage gardening (that is, as it was historically understood) in North America. The book is out of print, but can still be found. Entangled–I think I did read the Market Bulletins, right after I read Two Gardeners the first time. Your grandmother sounds like a bona-fide cottage gardener, before the term was co-opted by those with money. Jane–Look for my essay on the creeping bellflower in the August/September issue of Horticulture. I’ve been a recipient and a donor. My house is 60 years old and there was a peony farm across the street when it was built (sadly gone now), so we have lovely peonies. The little wild violets which I love and the creeping bellflower that I curse pass themselves along without help from anyone. I have lovely irises and primulas from my dear mother-in-law. Lately I have been giving, not getting, though – I unloaded a pile of herbs on my community garden’s shared herb bed (mint, french tarragon, chives, sorrel, rhubarb and thyme) and I’ve been giving lily of the valley to anyone who shows even a mild interest as a lot of it is being dug out right now to make room for the replacement of my sidewalks. 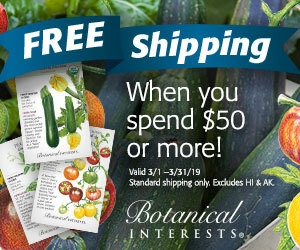 Kathy, have you read Gardening for Love: the Market Bulletins, by Elizabeth Lawrence? When you wrote “their passalong plants may have been the only nice thing in their lives at times”, it struck a chord with me and that book immediately came to mind. I’m also reminded of my paternal grandmother, who was always in charge of the vegetable garden (meaning she did most of the work), and never had much money to spend on anything as frivolous as flowers. But she always managed to have a few tiny flower beds – one under the black walnut tree (!) and one next to the garage where nobody wanted to mow grass. I’m not sure how she came by the plants in the first place, but some of them may have come with the house (like yours). A gardener must have lived there at one time – there was a large gingko tree on one side of the house. Kathy, I really enjoyed this post so much. I’ve had passalong plants for every garden I’ve ever cared for, and most of those were heirloom, cottage style. Food has always been my first priority, second medicinal plants and the pretty things seem to move to the forefront when I have time. I’ll put the book on my summer reading list.